Serving area expands to 56" wide with drop leaves extended. Large storage drawer for supplies. Locking cabinet has one height-adjustable shelf. Durable, 3/4" furniture-grade wood with stain- and scratch-resistant laminate finish. Assembly required with cam-lock fasteners. Greet guests and employees with hospitality. 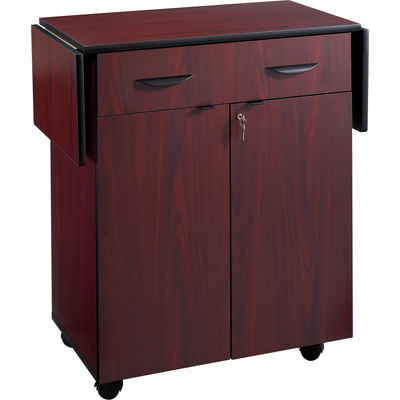 Drop leaf design extends serving area while the locking double door cabinet contains a height-adjustable interior shelf for storage of hospitality supplies. Spacious drawer organizes silverware, napkins and smaller items. Durable, 3/4" furniture-grade wood with stain- and scratch-resistant laminate finish. Assembly required with cam-lock fasteners.